Surround by teammates, Malik Williams sat inside the Mustangs clubhouse an hour before game time eyes glued to the television. The latest video game craze Fortnite has reached the Mustangs organization and Williams is a prominent competitor. His pregame competitions with teammates may be routine, but his journey to the clubhouse was not. A native of Toronto, Canada Williams made the 1,000-mile journey across country lines to spend his summer playing ball at Phil Welch. Williams name may seem familiar to some; his brother Joshua was a member of the Mustangs 2017 championship season. “He just told me to work hard and give it my all everyday,” Williams said. 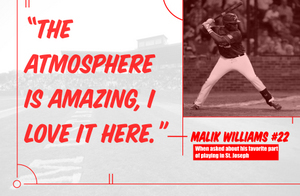 He did not get a chance to see his brother play in St. Joe last summer, but Williams quickly fell in love when he arrived in May. Three years apart, Williams and his brother played for the Ontario Blue Jays an amateur baseball program designed to develop baseball players. “We’re very competitive and like to earn our spots wherever we go,” he said. Despite his competitive nature, he isn’t ready to declare himself the premier baseball player in the family. “No comment,” Williams said with a chuckle. The Mustang’s first baseman is riding high after being named to the National Junior College Athletic Association All-American team. Williams batted .397 with 17 home runs and 78 RBI’s in his freshman season. Williams has embraced the challenges associated with summer ball, brushing off what can be daunting transition for some. It is off the field where Williams’s commitment to summer ball hits harder than most. A freshman at Johnson County Community College Williams has spent nearly a year in the states and has found some of America’s finest establishments. Everyone has his or her favorite fast food stops. For Williams it is not a discussion, Raising Canes stands above them all. “When you the canes sauce… can’t be that… can’t beat it,” he said. The taste of Canes sauce however is not enough to for the United States to beat the neighbors from the north in Williams’s eyes. “Canada, no question,” he said. Williams also stays true to his roots with his favorite music. He has yet to find someone that compares to his hometown artist Drake. When he steps to the plate on game days the Canadian rappers ‘Know Yourself’ blasts through the stadium speakers. Williams has had a chance to explore northwest Missouri when he is not in uniform. As a part of the Mustangs effort to better the community Williams and his teammates recently used an off day to help out with Food For Kids, which provides free meals for children in the summer. The experience left a lasting impression. “I noticed that not everyone is as fortunate as some people,” he said. Non-committal on if his baseball ability compared to his brother, the outspoken Williams has no problem boasting about who is best skills on the team when it comes to the pregame Fortnite competitions. You will have your chance to get in on the Fortnite craze when the Mustangs host Fortnite night. The evening will feature Special Photo opportunity wearing an in-game skin. Chest treasure hunt with the chance to win V-Bucks and even a Battle Pass!